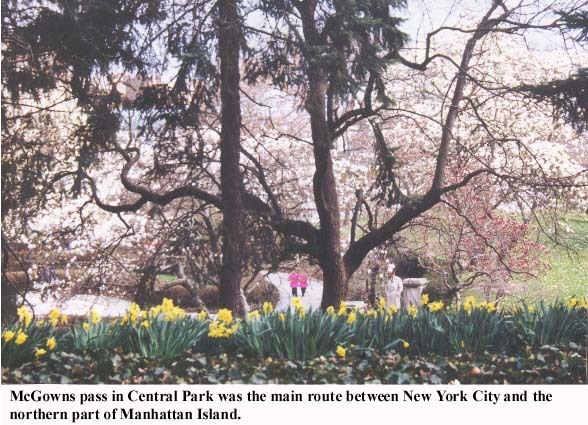 In two of his most important journeys in New York, Washington traveled through a pass now in Central Park. 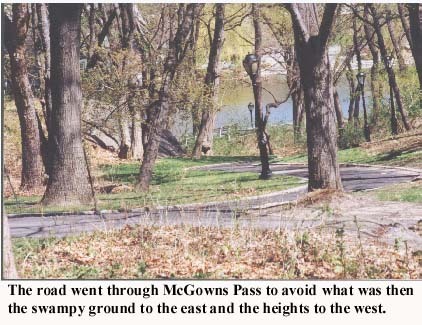 Washington's first memorable trip through McGowns Pass was in 1776 when he got word that the British were attacking Manhattan. He took off by horse from his headquarters in upper Manhattan and headed down toward the action. The British made their first landing at Kip's Bay, on the East River at about 34th Street. What Washington saw didn't make him happy. The Americans, under a heavy barrage of naval gun fire, had panicked. When Washington saw that they had run away without firing a shot, according to camp gossip, he cane-whipped privates, colonels and brigadier generals "with democratic indiscrimination." He is also reported to have thrown his hat on the ground and cried, "Good god, have I got such troops as these?" or "Are these the men with which I am to defend America?" Washington's next famous trip through the pass came in 1783 when he marched in triumph into New York as the British evacuated the city at the end of the war. 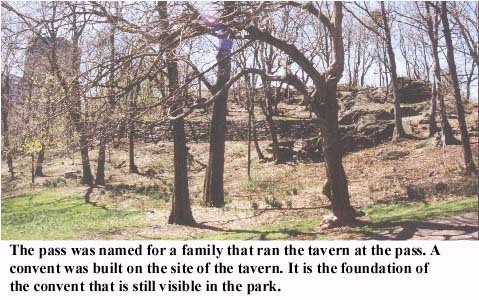 Address: Central Park, in from Fifth Avenue at about 106th Street. Tours: Occasionally given by Central Park Conservancy. 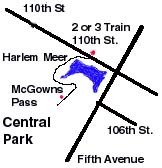 Transportation: Take 2 or 3 train to 110th Street (Central Park North) walk south into the park and around Harlem Meer and walk up the hill on the road south of the water. There is no marker, but you should see the foundation of the old convent. (From Columbia University, take 1 or 9 downtown to 96th Street and change to the 2 or 3 uptown).